i-Touch V27 Wooden Lectern Unit with 15;; finger and stylus touch screen - Future Generation Kiosk Products. 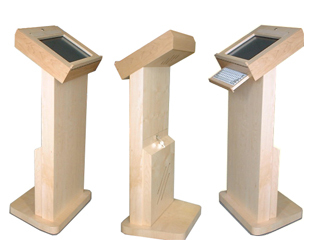 The Lectern Kiosk unit is designed for use at public events, such as conferences and presentations. The unit has an in-built Video amplifier to allow connection with an Overhead Projector for larger audiences.